Country superstar Dolly Parton turns 71 years old on Jan. 19, and the iconic singer has more than a few things to celebrate. Born the fourth of 12 children, her rise to fame is a true rags to riches story. Seemingly destined for fame from a childhood, Parton learned to play the guitar when she was eight years old, recorded her first single at age 13 and even sang at the renowned Grand Ole Opry. After graduating high school in 1964, she moved to Nashville to become a country singer, and the rest is history. Take a look at Dolly Parton's career and find out how she earned her fortune. 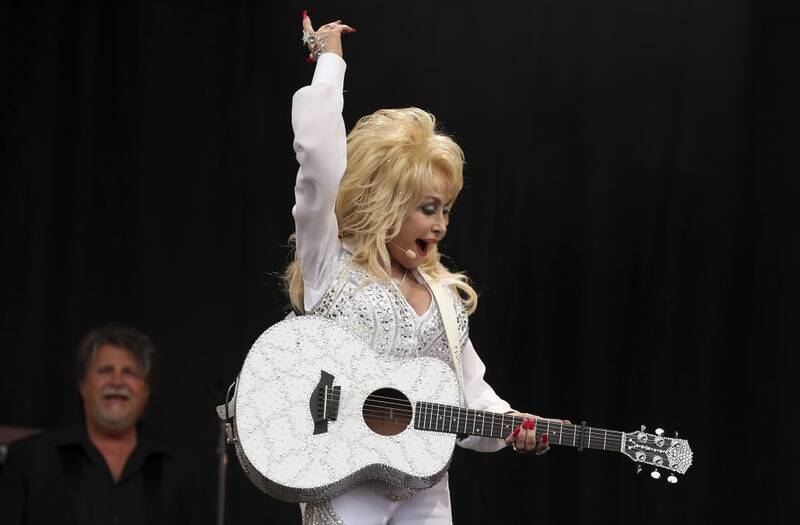 Already larger than life, Dolly Parton's net worth keeps on growing. In 2016, she added another $19 million to her fortune, according to Forbes — making her one of the richest female singers ever. Notoriously down-to-earth, the 60-year show business veteran celebrated 50 years of marriage with husband Carl Dean in 2016. She's touched the lives of fans for decades — including goddaughter Miley Cyrus. Like many other celebrities, Parton is a charitable star who gives back and has never forgotten her roots. In 1995, she founded Dolly Parton's Imagination Library, which mails preschool children books each month. To-date, the program has donated more than 80,000 books to children in the U.S., Canada and the U.K.
She was also quick to step in when deadly wildfires ravaged her home state of Tennessee in late 2016. Parton launched the My People Fund, which will donate $1,000 per month for six months to those whose homes were destroyed by the fires. Most people associate the smash hit "I Will Always Love You," with Whitney Houston, but it's actually one of Dolly Parton's songs. Initially released in 1974, the song was on her "Jolene" album. Written by Parton and originally performed exclusively by the country crooner, the song secured the No. 1 spot on the U.S. Billboard Hot Country Songs charts twice. Its initial ascent to the top was in 1974 when it was first released and it's second in 1982 when she re-recorded it for "The Best Little Whorehouse in Texas" soundtrack. In 1992, Whitney Houston recorded the song for the film "The Bodyguard." Also a hit, this version soared to the No. 1 spot on the U.S. Billboard Hot 100 and spent 14 weeks there. "The Bodyguard" soundtrack is one of the best selling albums in history, with more than 17 million copies sold. Additionally, Houston's take on "I Will Always Love You" has sold more than 6 million singles– and Parton owns the publishing rights. Immediately following Houston's Feb. 2012 death, sales of the song surged to 735,000 tracks in a less than a one month span. This culminated in a $70,000 payday for Parton, according to The Hollywood Reporter. Total earnings from the song have not been publicly released, but Parton was expected to earn millions in royalties from Houston's version. Several other singers have also covered "I Will Always Love You," and Parton cashes in with every sale. Madonna's been rocking the charts since the 1980s and shows no sign of slowing down. The “Material Girl” was named Billboard’s 2016 Woman of the Year, thanks in part to her status as the highest-grossing female touring artist in history. Her "Rebel Heart Tour" — which came to a close in March — sold more than a million tickets and grossed $170 million. And, since 1990, her shows have amassed more than $1.3 billion in gross sales. He rose to fame as part of the rap group N.W.A., but Dr. Dre has become one of the most famed hip-hop producers of all-time. Dre co-founded Death Row Records in 1992 before creating Aftermath in 1996. Over the years, he's played a role in launching the careers of several iconic rap artists, including Snoop Dogg, Tupac Shakur and Eminem. However, the “Nuthin But A 'G' Thang” rapper's biggest payday yet came in 2014, when he sold the company he co-founded, Beats Electronics, to Apple for an impressive $3 billion. Dallas Mavericks' owner Mark Cuban is one of the richest celebrities in sports. Before buying the NBA team, Cuban and his college friend Todd Wagner earned $5.7 billion when they sold their video portal, Broadcast.com, to Yahoo. Since then, Cuban has bought stakes in a number of companies, including Landmark Theaters, Magnolia Pictures and AXS TV. One of Hollywood’s leading directors and producers, Steven Spielberg boasts a seriously impressive fortune. Since entering show business in the early 1960s, he’s won four Academy Awards — one for “Saving Private Ryan,” two for “Schindler’s List” and the Irving G. Thalberg Memorial Award — and garnered more than $9.3 billion at box offices worldwide, according to BoxOfficeMojo.com. The top- grossing director of all time, Spielberg is also a principal partner at DreamWorks. On Jan. 20, 2017, Donald Trump will make history when he becomes the first billionaire U.S. president. The real estate mogul earned his fortune by cultivating a large portfolio of luxury properties around the world, including hotels and golf clubs. Also a seasoned reality TV star, he hosted “The Apprentice” from 2004 to 2015 and will remain the show's executive producer for the 2017 season airing Jan. 2. He grew up in poverty, but Ralph Lauren has created one of the most successful fashion empires of all time — and developed a fortune that puts him among the world's richest individuals. In 2015, he stepped down from his role of Ralph Lauren CEO but maintained his chairman position. Largely considered one of the most talented investors on the planet, Warren Buffett is the CEO of Berkshire Hathaway. Nicknamed the "Oracle of Omaha," Buffett is also one of the richest celebrities of all time, but he maintains a notably modest lifestyle. He’s lived in the same Omaha, Neb., home since 1958 — purchased for $31,500 — and drives a 2014 Cadillac XTS. Many celebrities have their own business, but Dolly Parton has an amusement park. In 1986, she joined forces with Herschend Family Enterprises to transform the company's existing Silver Dollar City theme park into Dollywood. More than 30 years later, Dollywood is still going strong. The 150-acre park is the most-visited tourist attraction in Tennessee, with more than 75 million guests since its inception. It has approximately 2.5 million visitors annually, with one-day adult tickets priced at $67. Located in Pigeon Forge, Tenn., Dollywood is Sevier County's largest employer. The successful tourist attraction continues to expand. In 2015, Dollywood's 300-room luxury DreamMore resort opened — a total investment valued at $300 million. If you're planning a visit to the park, be sure to check the website first, as Dollywood hours vary. It's open roughly nine months per year and Dollywood's Splash Country water park operates from Mid-May through Labor Day. VIP Dollywood tours are available, so plan ahead to make your visit extra special. Also an accomplished actress, Parton has acted in nearly three dozen films, television shows and TV movies — garnering more than $300 million at the box office. Most recently, she starred in the 2016 NBC TV movie "Dolly Parton's Christmas of Many Colors: Circle of Love." Next up, she'll lend her voice to an episode of the animated series "Lily's Driftwood Bay." Parton has received several honors for her work. She was nominated for an Oscar in 1981 for Best Original Song for "Nine to Five" — from the movie of the same title — and again in 2006 for the song "Travelin' Thru" from the movie "Transamerica." Parton also received three Golden Globes nods for "Nine to Five," and one each for "The Best Little Whorehouse in Texas" and "Transamerica." The country songstress really knows how to draw a crowd. Dolly Parton's 2011 "Better Day" World Tour included 50 stops from Knoxville, Tenn. to Melbourne, Australia, and sold nearly 275,000 tickets. It was her most successful tour yet, grossing $34 million. Dolly Parton's age isn't slowing her touring schedule down one bit. In 2016, she kicked off her 60-city "Pure & Simple Tour" and released the new two-disc album "Pure & Simple with Dolly's Biggest Hits." Fans were willing to pay top dollar for her first major U.S. and Canadian in more than 25 years. Prices varied by city, but ranged from $100 to $500 at Greenville, S.C.'s Peace Center. The $500 ticket price was the most expensive concert ticket ever at the venue.